Why and When Choose an Orthopedic Style Dog Bed? Have you noticed that your older dog is shifting more in bed or having trouble getting in and out of bed? 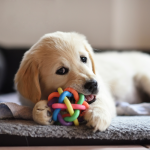 Maybe you have found out that your middle aged dog is developing hip dysplasia or arthritis and you want to prevent symptoms from developing for as long as possible. It could be that you just want the best possible bed to spoil your beloved furbaby. Whatever your reason for considering an orthopedic bed for your dog, these top 10 best orthopedic dog bed reviews can tell you what you need to know to make an informed decision. The best orthopedic dog beds can let your dog rest comfortably so she will wake feeling refreshed, and have your old dog acting like a puppy again. 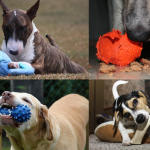 There are a lot of dog beds on the market, and it can be challenging to find the best orthopedic dog bed, especially if you need a waterproof orthopedic dog bed or an orthopedic dog bed for a dog that can’t get up or lie down easily. Whatever size or age your dog is and whatever special conditions she may have, you can find the perfect orthopedic dog bed for your dog. Orthopedic beds, whether they be for dogs or people, work to eliminate pressure points. Pressure points are that stiff, painful feeling you have when you put too much weight on one area of your body for too long. Soft beds can eliminate pressure points, but may not give enough support to the spine, causing pain in the neck or joints. Orthopedic beds seek to find a balance between firm spine support and the elimination of pressure points. The orthopedic bed that is best for a labrador may not be the best bed for a great dane, and neither will be the best orthopedic bed for a dachshund. Think about how your dog likes to sleep, her weight, her age, and the likelihood that she may soil the bed to choose the bed with the right features for your dog. If you have several dogs that like to sleep together, choose an orthopedic bed that can provide enough support and room for all of them. The only material that can really accomplish even weight distribution is memory foam. The most expensive beds feature a solid piece of memory foam, while less expensive models may have shredded or blended foam. A solid piece of foam provides even distribution of weight throughout, while foam that is shredded may be a little softer and will not communicate pressure between fibers as well. You want the best for your dog, but if you have a very large dog or more than one bed to purchase, the cost of solid memory foam may be too much. In general the thicker the mattress, the more comfortable the bed, but this is heavily dependent on material. A four inch solid memory foam mattress will feel more plush and offer more support than a six inch blended foam mattress. The heavier your dog, the more support she needs. Be aware that solid memory foam that is calibrated for a heavier dog may not be comfortable for a smaller dog, so if you have multi-size dogs that like to sleep together, a thick blended material may be better for suting all their needs. You can also put a plush blanket over a dense memory foam mattress to soften it for smaller dogs. The bigger the bed, the more it will cost and the more room it will take up in your space, so you want to choose a bed big enough for your dog, but not bigger than she really needs. Your dog’s sleeping style affects the size as well. Dogs that like to curl tightly against a bolster may prefer a smaller bed than dogs that sprawl out. In general, the bed you choose should provide support for the head, chest, and hips. Sprawling sleepers don’t usually mind if limbs stick over the side of the bed. If the orthopedic bed you choose is not waterproof one big accident could ruin it. Memory foam, either solid or blended, is not an easy material to clean. If your dog has never soiled her bed, you may feel confident that this is not a concern, but remember that dogs are more likely to develop incontinence as they age, and any dog may throw up unexpectedly on her bed. Even heavy drooling can give a permanent smell to an unprotected memory foam mattress. If your dog is not prone to wetting the bed, a water resistant material may be sufficient to give you time to wipe up little messes or drool, but if your dog has had accidents before or is getting older, a waterproof cover may be a good idea. Most dogs do some degree of “nesting”. This means that they scratch and circle before they lie down and may scratch frequently while sleeping. Even though this scratching isn’t really making a memory foam mattress more comfortable, this is a deeply rooted instinct and most dogs nest regardless of whether their behavior is having any effect. A dog who scratches frequently or heavily can tear or puncture the cover of their bed, ruining the look and destroying waterproofing. Many companies sell extra covers along with their beds, but if your dog is a big scratcher you may want to choose an orthopedic bed with a durable cover. When adopting a giant breed, you expect certain considerations as your dog ages. Very large breeds are more prone to joint problems, especially with their hips, and getting up can become much more difficult as they age. Giant breeds support a great deal of weight on pressure points when they sleep, so a very good orthopedic bed is exceptionally important for them, and it is better to provide it before symptoms develop. 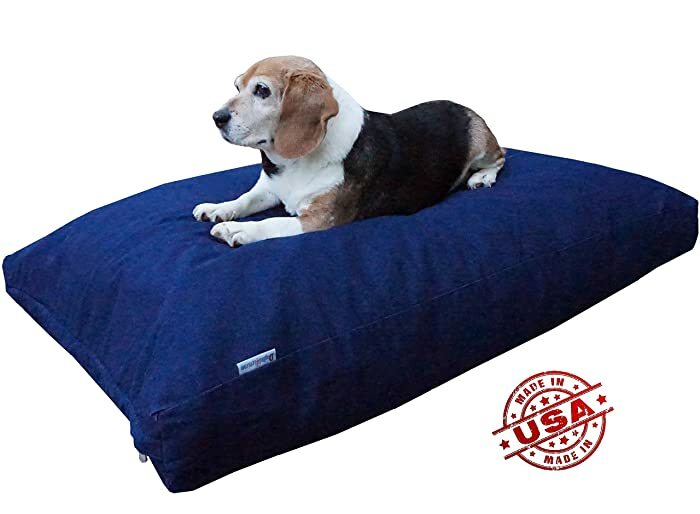 If you want the absolute best for your giant dog, consider the Big Barker 7″ Pillow Top Orthopedic Dog Bed. This bed isn’t cheap, but it may keep your giant dog happy and healthy for longer, as well as making it easy for your large dog to get up and down in bed. This bed is made entirely of a foam developed by Big Barker to provide ultimate weight distribution compared to thinner memory foam or traditional pillow beds. This bed is guaranteed to retain at least 90% of its shape and support for 10 years, giving you confidence that you will never need to buy another bed for your giant breed dog. The pillow that is built in gives extra support to your dog’s neck. If you buy the separate waterproof cover this can quickly become the best waterproof orthopedic dog bed. Open cell foam lets air move through the bed for a cooler sleeping experience for your dog. Machine washable cover that is easy to remove. This bed is expensive, at nearly $400 for the giant size. Bed is not waterproofed, so a big accident could ruin the bed. Not comfortable for smaller dogs since the foam is calibrated for giant dogs, so if multiple dogs sleep together this is not the best bed. Still becomes too warm despite cooling foam. This bed provides the most support available for a giant breed dog, and may relieve pressure so your dog sleeps better and has better mobility in her waking hours for years to come. This bed comes at a high cost and a waterproof cover must be purchased separately at additional cost. If you are buying a large bed, you may not want to spend what it will cost for a 100% memory foam bed. 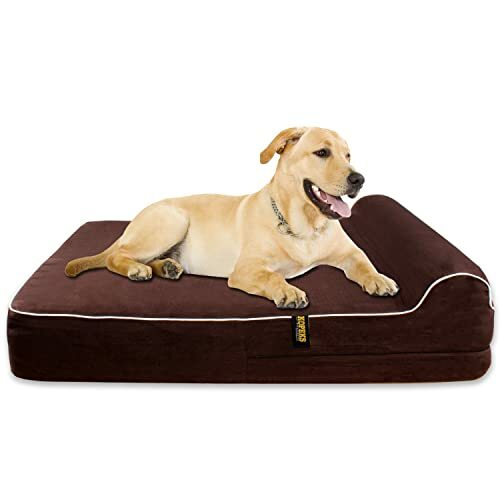 The Milliard Premium Orthopedic Memory Foam Dog Bed offers a good balance between orthopedic support with a memory foam topper and a sturdy foam base. Your dog will enjoy the form fitting support of memory foam while the sturdy foam below absorbs extra pressure. Rubber grips on the bottom of this bed keep the bed from slipping on hard floors. A waterproof, washable cover can be zipped off when it gets dirty. The material will not shrink in the wash and is easy to put back on with zippers along two sides. You can easily buy more covers if your dog soils the bed frequently and you don’t want to have to wash every time. Materials used in this bed are certified safe and chemical free by CertiPUR-US. Cover is easily removable and won’t shrink in wash.
Doesn’t offer as even weight distribution as 100% memory foam. Cover is thin and may be pierced by dog’s nails. Bottom no-skid doesn’t work well and bed may still skid. This bed offers a good balance between support and affordability with a memory foam topper and foam base. It offers enough weight distribution for the average large dog needing some relief from pressure points. For the midsize dog who loves to snuggle, the PetFusion Ultimate Pet Bed provides a perfect cozy place with good support. This bed has a solid four-inch memory foam base that absorbs pressure and equalizes weight distribution no matter the size of the dog, so that smaller dogs can lie with medium sized dogs in this bed comfortably. The outer bolster lets your dog cuddle under or lie her head on top for versatile, comfortable lounging. The water-resistant cover is removable for washing and additional covers are available from the company. Four inches of memory foam provide great weight distribution for mid-size dogs. Cozy bolster for nestling under or resting head on. Machine washable removable outer cover. If your dog weighs too much four inches of foam won’t give sufficient support. Dogs that like to stretch out while sleeping may find bolster confining. Cover is not water-proof, just water resistant. This cozy bed is perfect for medium sized dogs that like the support of a cozy bolster to nestle under. Four inches of memory foam provide support for small or midsize dogs, but may be too thin for heavier midsize dogs. 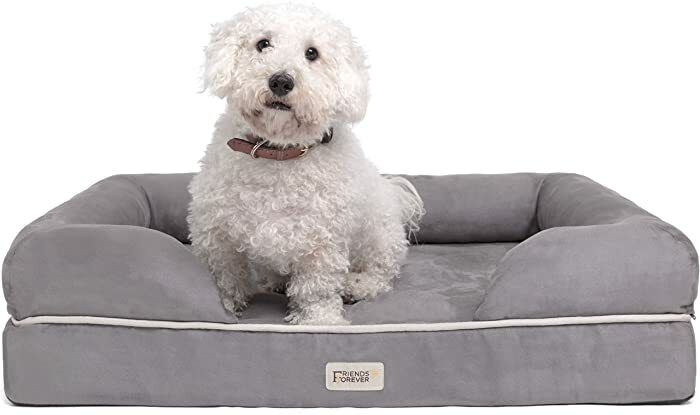 If you think your little dog deserves human-level orthopedic mattress quality, the Friends Forever Premium Orthopedic Dog Bed may be right for you. This little bed features solid human grade mattress foam. The poly-filled bolsters offer superior bone support so your dog can find just the right sleeping angle. This bed is designed to be on the larger side for your small dog so she has room to stretch out as well as curl up. This is also a great bed for several small dogs that like to sleep together. The cover is easily removable and machine washable. A non-skid bottom keeps the bed from sliding around when your dog gets in and out. Human grade orthopedic mattress foam. Versatile bolster is good for cuddling under or lying on, great for hip support as well. Large enough for your small dog to stretch out. Water resistant, not waterproof cover. Very low so not good for dogs with longer legs that have trouble getting up. Rubber grips might fall off in wash. This bed for your spoiled little dog features human grade orthopedic mattress foam and a cozy bolster, and is large enough for your small dog to stretch out or for several small dogs to cuddle. This low bed isn’t great for long legged small dogs that have trouble getting up and the cover isn’t waterproof. 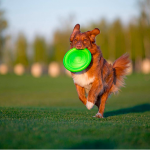 Helping your dog cope with hip dysplasia can be very difficult. 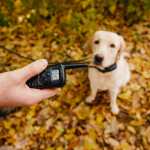 Depending on your dog’s situation, she may become symptomatic early or late in life, and may or may not be a candidate for surgery. A bed that relieves the pressure on your dog’s hips can help make her comfortable and aid in healing while she sleeps. Your dog may become affected with this problem when she is still young and possibly destructive, so you may not want to spend hundreds on a supportive memory foam orthopedic bed for her. 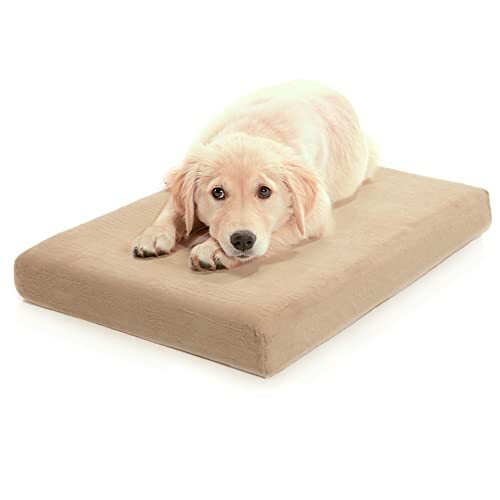 The First-Quality Orthopedic Dog Bed provides good support for a reasonable price by utilizing shredded memory foam. 5 inches of this material provides enough support, provided your dog is not too heavy. Features like a waterproof lining and durable cover keep this bed looking and smelling good for the long term, no matter what your dog throws at it. Affordable, deep memory foam bed. Waterproof lining and durable cover. Shredded memory foam won’t equalize weight distribution as well as solid memory foam. Foam tends to pouch out in places, looking unattractive and providing uneven support. For dogs with hip dysplasia, especially young dogs who may still be destructive, this is a good affordable choice. Five inches of shredded memory foam offer good support while durable fabric and a waterproof lining keep this bed looking and smelling good for years to come. If your dog is struggling with Arthritis, you need the most support possible for her painful joints. 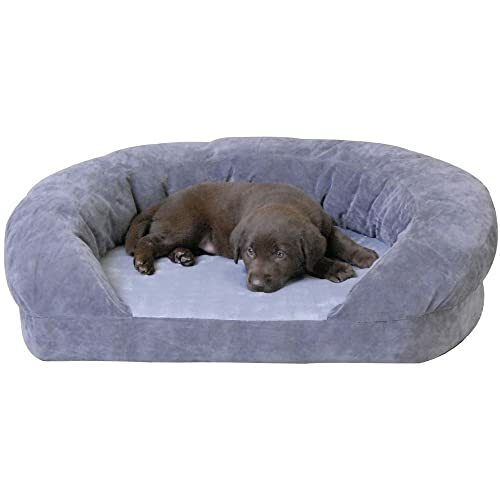 The KOPEKS Orthopedic Memory Foam Dog Bed is a great pick for arthritic dogs due to the seven inches of memory foam that is comparable to foam in human mattresses. If your dog is struggling with arthritis there is a good chance she may be having trouble holding it between potty breaks as well, so it is especially important that your bed has an effective waterproof liner like this one has. A soft suede cover with an anti-slip bottom covers the waterproof liner and can be easily washed. For dogs struggling with the pain of arthritis, seven inches of solid memory foam offer ultimate softness and support for painful joints. A built-in pillow gives added support, while the waterproof liner means your elderly dog’s accident will be no big deal. 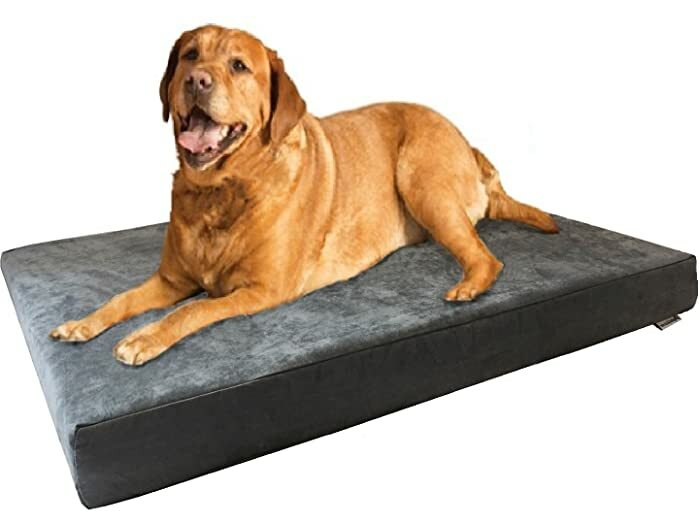 This is the best orthopedic dog bed with waterproof protector pad and removable cover you are likely to find in this price range. If you have a very large arthritic dog, this bed may not be large enough for her. If your older dog is having trouble getting up and lying down, the Petlo Orthopedic Pet Sofa Bed may be a comfortable solution. The larger the size of the sofa you choose, the higher it will be. The extra-large size is a whopping 10 inches off the ground, making it easy for your dog to drop into the bed and crawl out. The solid bolster also helps your mobility challenged dog push off to get up out of the bed. High density memory foam that gets thicker with larger sizes. Raised couch design great for dogs that struggle with getting up. Large dogs may feel confined by bolster. Zipper is not heavy duty. Dogs that have trouble getting up need plenty of orthopedic support, but they also need a bed raised off the ground so they can lie down easily and step out smoothly. This bed gets thicker with larger size so you can feel confident that the bed will be high and thick enough. The cover and zipper are not heavy duty, so if your dog is a big nester this bed may not be best for her. If your dog loves to push herself against a cushion while she sleeps and you want a bed that also provides orthopedic cushioning, the K&H Pet Products Ortho Bolster Sleeper Orthopedic Dog Bed might be your perfect choice. Three inches of solid, medical grade orthopedic foam offers even weight distribution while the Poly-Fil bolster is a cozy back to push against around most of the bed. This bed is has a velvety micro-suede bolster cover and a soft quilted fleece base cover. If you want to spoil your dog with cuddly luxury, this is a good pick for you. This is a better pick for smaller dogs, even multiple small dogs since three inches doesn’t provide enough support for heavier dogs. This luxurious, cozy bed is super soft and cushy for the dog who loves to snuggle. The thick, fluffy bolster and super soft fabric will make your dog feel like a king. Three inches of solid memory foam offer good support for smaller dogs but is not sufficient for midsize or larger dogs. If your pooch sleeps hot and is often leaving her bed for the hard floor in warm weather, the Dogbed4less Orthopedic Gel Cooling Memory Foam Dog Bed can make her comfortable. There’s not much point in investing in an orthopedic bed if your dog feels too hot on it to sleep there. This versatile bed has a waterproof inner liner to protect the memory foam, a durable microsuede cover, and a gel infused memory foam pad that you can slip in to cool the bed when desired. This means that this bed will be equally useful in hot or cold conditions. Four inches of solid memory foam offers a lot of support to your average sized dog, but if you have a giant breed you may want more support. Suede cover will wear down faster than bed and need to be replaced. If your dog seeks out the cool of the hard floor over the support of her bed, this cooling orthopedic bed can make your dog comfortable and supported at the same time with an effective cooling insert. This bed is without bolsters and the cover wears down quickly, so if your dog is a snuggler or a nester this may not be the best bed for her. 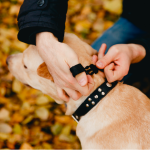 If your dog can be on the destructive side in bed, scratching and nesting continuously as she settles down, you may be frustrated by buying replacement covers over and over again. 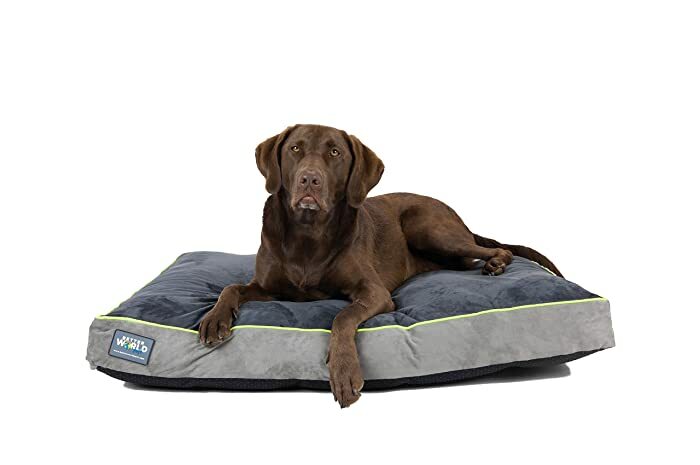 This Premium Durable Orthopedic Shredded Memory Foam Dog Bed is designed to resist your dog’s scratching for years to come. An inner cover is waterproofed on the top and water resistant on the bottom for air flow. A durable denim cover is made of 100% cotton and has extra stitching for added durability. This bed is priced reasonably enough that even if your dog does destroy it, you can buy another. The fill of this bed is blended shredded memory foam, poly-fill, and polyurethane foam. This fill won’t offer quite as much support as a solid memory foam bed but it is much more supportive than a standard bed. 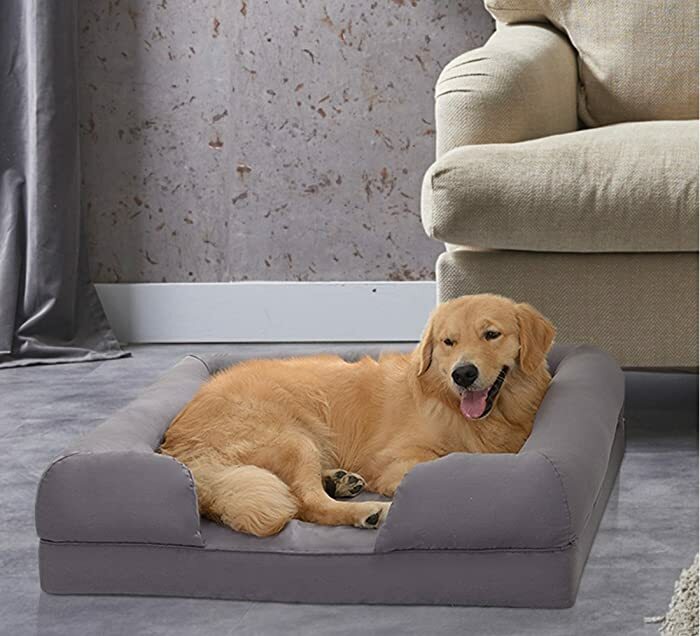 For the dog who needs support but is still prone to being destructive, this blended memory foam orthopedic bed offers six inches of foam stuffing and a 100% cotton denim cover that will stand up to heavy scratching and nesting behavior. This bed won’t offer as much support as a solid memory foam bed and lacks a bolster or pillow. No bed is a perfect fit for every dog. You know you dog better than anyone. Does your dog love to cuddle under cushions or sprawl out most of the time? Is your dog usually curled up and feeling chilly, or is she always trying to cool off on your hard floors? Is your older dog with arthritis or joint pain having a harder time getting up and down? Now that you know the options available, make a list of the things your dog needs in a bed and honestly consider how much you can afford to spend, then choose the perfect orthopedic dog bed for your dog.